“Floating gardens, past and present”. a self-sufficient, modular agricultural system that produces fresh vegetables on any water mass (salty, brackish, polluted) you choose. Once built (with recycled materials, using mostly low-cost tech), you just pop it into the water, set the seeds… and that’s it. It requires no land, no energy inputs, no nothing. Like a plant, it just needs sun, air, and water to turn light into food. This isn’t only a great concept: several fully-functional prototypes exist already —and they work beautifully. No wonder they’ve won accolades and prizes all over the world (despite having some trouble finding investors to take the project to the next stage. Ahh, the market economy: never fails to amaze me…). This floating-orchard idea reminded me of another kind of floating garden I’d read about some time ago, while doing research for my first book: the chinampas, also known as the floating gardens of the ancient Aztecs.  I hadn’t been able to dive deep into chinampa-research back then, so after reading about PNAT’s Jellyfish Barge, I thought: chinampas, here I come… now’s the perfect moment to reveal that this floating garden thing is no 21st century invention, but that it has deep roots in Mesoamerican agriculture. 3. Write a fascinating article on Aztecs, floating gardens, sustainable agriculture, and human ingenuity. Romantic depiction of a chinampa in Arthur Magin’s Histoire des jardins anciens et modernes (1887). The problem comes when Step 1 yields no clear results and Step 2 turns into a painstaking search of scientific papers that truly really explain how those dang things worked… and after double-checking all the available archaeological, documental and agricultural data —you find out that your initial assumption was wrong. The analogy you were so sure about? It doesn’t exist (or, rather: it’s highly likely it doesn’t exist). In a nutshell: chinampas do not float (and never have). How do chinampas actually work? In 2004, the Mexican Institute of Water Technology (IMTA) published a booklet entitled Manual de Construcción de Chinampas. It basically tells you how to build a chinampa, should you want to do so. (The tradition was never really lost, and it never stopped, it has just… sagged, so to say. Chinampa in San Luis (Photo by P. Crossley). If you want to build a lake-chinampa (another option is a land-based chinampa o camellón), you must find a suitable lake or marshy terrain: it should have shallow margins, yet stable ground to stake your claim. And stake it you shall, with literal stakes of ahuejote (Salix bonplandiana) that will grow into trees relatively quickly. They will delineate the borders of your chinampa*, further stabilise the soil and keep the waters of the channels between chinampas clean. *Some advice: shape it as a rectangle, and make it less than 20 metres wide. Next you shall prepare a soil-containing mesh (chinamil) made of cane reeds, and place it between the stakes. Finally, you will heap organic matter onto (into?) your chosen rectangle of soil, bound by stake-and-mesh. Leave it to dry a few weeks, and then cover it with piles of muddy soil taken from the marsh ground. Be mindful to dig canals around your chinampa (so that land may be adequately watered). And, for a beginner’s level chinampa, you’re good to go. They are more adequately described as “raised beds”; very productive, very impressive, very clever just as they are. So, one may wonder: why on earth did we turn them into floating gardens? And once we invented such wonderfully romantic (yet inaccurate) idea… why has it stuck around for so long? Who invented the idea of the Aztecs’ “floating gardens“? The first mention to Mexicans growing food on floating gardens is in a book by the Jesuit José de Acosta. Born in Medina del Campo (Spain) in 1540, he was ordained at twenty-six, and it wasn’t long until he was granted permission sail to the Americas, where he spent seventeen years preaching, learning, and writing about his experiences. His best-known work —Historia natural y moral de las Indias— was first published in Seville in 1590. In it he included a legendary story about the Aztecs’ arrival to Mexico, and how the region’s previous inhabitants extracted yearly tributes from their new neighbours under the form of floating “seedbeds”. The Aztecs managed to overcome this apparently impossible task with some divine help, and Acosta narrates how they “floated the seedbeds” before their neighbours’ king, little gardens full of maize and chili, tomatoes, beans, chia, pumpkins &etc. A star-idea had been born. In 1780, the abbot Francesco Saverio Clavigero includes another, more elaborate story about chinampas in his work Storia di Messico (History of Mexico). He describes floating, mobile gardens built on a base of buoyant plant material that holds and contains the muddy sediment heaped atop this raft. He even points out that the bigger gardens usually have small trees growing there, even a neat little hut for the farmer. To Clavigero’s mind, this system’s advantages are obvious: if the owner of a chinampa argues with his neighbour, or if he just wants to change neighbourhood, he need only hop onto his floating garden and row himself and his chinampa —beans, flowers, hut an’ all— virtually anywhere (s)he wants. Fast forward twenty years. Humboldt and Bonpland reach New Spain; once more we have a reference en passant to chinampas, which Humboldt divides into two groups: stationary, and movable. Paseo de la Viga con la iglesia de Iztacalco (Paseo de la Viga with the church of Iztacalco), by Pedro Villegas (1706). Thanks, Wikipedia. From his rather vague description of the movable chinampas, one suspects that he never saw them (indeed he never claims having done so, whereas he did eyewitness other “plant islands”, eg in Tivoli and Guayaquil). He did see stationary chinampas though, in the Canal de la Viga between lake Chalco and Texcoco. After that, similar mentions kept appearing in the literature, alluding to Mexico’s floating gardens that were either about to disappear, or that had already disappeared (due to lowering water levels) and become the stationary chinampas that could actually be seen. By then we have fallen in love with the idea of floating gardens. Never mind that Mexican chinampas don’t float now; those built by the Aztecs’ must’ve been different! Its past existence is never called into question. A myth has been born, only it’s now presented as fact: it has acquired a patina of truth by dint of repetition. Why do we love the idea of floating, movable gardens? Why do we love it so much that we haven’t only invented it but also kept it alive for the last 400 years? Recall that Clavigero (18th century) believed a floating chinampa’s main advantage was that you could change neighbourhood at any time. However, to a modern-day chinampero, the mere idea of movable chinampas sounds absurd: even if it were physically possible, why on earth would anybody want to move a chinampa? Why should the notion of floating gardens be so attractive to a 18th century priest or a 19th century traveller (or a 21st century reader)— yet utterly incomprehensible to a 21st century Mexican farmer? Gorgeous sunrise filtered through the ahuejotes growing in a Xochimilco chinampa, captured by Serge Saint. How objective are you when it comes to evaluating your “mother culture(s)”? Do you think it is God’s gift to humankind? Do you believe it responsible for all the world’s disasters, and see the roots of True Greatness in other cultures instead? If you answered Yes to either question, you are biased*. Here’s a consoling piece of news: you are not alone. *One could argue that —regardless of the answer— we all are biased. I would agree. Let’s take, say, 19th century Europe (and Western civilisation in general). The Romantics’ disenchantment with (their) reality often fuels a Quest for the Ideal far from home, both in space and in time. Re-imagining lost indigenous civilisations as cultures of ingenuity, intelligence, tenacity and grandeur is a common pursuit (as well as envisioning newly-discovered, remote islands as “lost paradises” where humankind’s intrinsically good, innocent nature has remained uncorrupted by the evils of the West). Chía (Salvia hispanica), mentioned by Acosta as one of the crops grown on his floating seedbeds. Some of them felt the urge to go beyond imagining: they actually travelled to those places… and they had to reconcile their beliefs with the reality they witnessed, because sometimes (often? Always?) those two did not match. And thus the beautiful dream lives on. no written account can be an unbiased description of reality as it is. The writer (thankfully!) chooses, filters, organises and constructs a narrative that highlights certain facets of reality—and obscures others considered irrelevant to the writer’s purpose. What’s relevant for a mining treatise might be entirely superfluous for a bird-watching manual, and the “reality” depicted in the book will be very different depending on the writer’s ideology, purpose and knowledge of the subject. Now, if we wanted to write a travelogue that’s both informative and entertaining, we’d probably want it to be picturesque, with a hint of local flavour —but not too much: just enough to make it appealing to the reader. A written postcard, so to say. As a consequence, anything that didn’t serve your purpose would be left out… and thus the seedy, dirty, messy* parts of reality wouldn’t make it into the pages. *Mind, I’m not saying that chinampas or chinamperos contemporary to those Romantic writers were dirty&etc. The only thing that matters is whether ‘Western’ travellers (no matter how wrongly) believed it. In a way, they ceased to exist. The first time an explorer sets foot on an uncharted piece of land, she carries no map in her pockets and no planned routes to cover. However, it often happens that travellers don’t just go see places with virgin eyes: they carry travelogues and guides, the published narratives of travellers that had already visited those lands, describing what one may find there, things worth seeing, and so on. A bad thing? Not at all. But from the moment your chief interest is, say, “following in Humboldt’s footsteps in Mexico” rather than “seeing the country as it is”, you are wearing a distortion lens that will shape the whole experience: the routes you take, your interactions with the peoples and the place, the very way you look at things… You don’t fully live reality: you are following, to a greater or a lesser degree, a script narrated in a book. A book can be both a travel-window into remote lands, and a distorting filter that stands between the traveller and the realities of that place. If we also consider the Romantics’ eagerness to pour their own emotions onto the landscape (rather than “objectively, scientifically” describing a country)… I can see how, while visiting Mexico, they might’ve selectively stitched together those pieces of reality that supported their previous ideas and advanced their theses. Joel R. Poinsett’s mention (yup. He of Poinsettia fame) to the floating chinampas he never saw (vs. stationary ones, which he did see in the Paseo de la Viga). If you fervently believe that “the West” stole our innocence, freedom, nobility, etc. ; and you (perhaps unconsciously) want to find proof that those Other, non-Western civilisations were wonderful and perfect… don’t you think you might become accidentally blind to any evidence that goes against your preconceived notion of what reality should be like? And if dozens of travellers have mentioned the “floating gardens of the Aztecs” while visiting Mexico before you… wouldn’t it be weird if you didn’t mention them, too? Wouldn’t your readers, perhaps already familiar with the literary descriptions of Mexico, be surprised—nay, even annoyed if you didn’t include them in your narrative? Ever been to a country to visit its archaeologic and historical sites? A picture of chinampas appeared in Karl Weule’s Leitfaden der Voelkerkunde (Leipzig, 1912). Thanks, Wikipedia! Whereas the Aztecs had been able to create and maintain floating gardens, those poor Indians that lived and died a few meters from the travellers were “only” capable of building gardens on the margins of muddy lake-shores. Looking into a less-than-perfect present isn’t as attractive as looking back to a golden past. This idea had occurred to me in Greece. I wondered about how darn hard it must be, living in a country with such a glorious, idealised past—and knowing that it’s likely you’ll never, ever be able to compete with that platonic version of yourself. Fights against imaginary, past versions of yourself are lost battles: they will always come out shinier, bigger, better… because they needn’t be true to reality. I know that chinampas never floated. I know now— and yet I still wish they had. I wish I could hold onto my floating gardens, because they are such a lovely concept. Floating gardens are amazingly good to think. Truth doesn’t make facts stickier, nor more memorable. And we often give more credit to things that fit into our narratives of reality, rather than to those that —despite being true— clash with the stories we tell ourselves and others. Sometimes myth & romance are much more attractive than reality. This needn’t be a problem, mind… unless and until we confuse them, and end up preferring the beautiful floating fiction, rather than the muddy, solid truth. If jellyfish barge is something that interests you, go straight to PNAT’s website section on the project, or to the startup’s Facebook page where they publish the latest news. The Planthunter also has a lovely article on this truly floating farm: Jellyfish Barges: the future of urban farming? The first book where I discovered the chinampas (technically correct, yet slightly misleading) was Murphy, D. J. 2007. People, Plants and Genes. The Story of Crops and Humanity. Oxford University Press. The article that began to clear up the chinampa-mess in my head was Crossley, P. L. 2004. Just Beyond the Eye: Floating Gardens in Aztec Mexico. Historical Geography 32: 111-135. Storia antica del Messico (…) (volume II, Book VII, 27: Campi, ed orti galleggianti nel lago messicano). Ensayo político sobre el reino de la Nueva España (vol. I, book III). 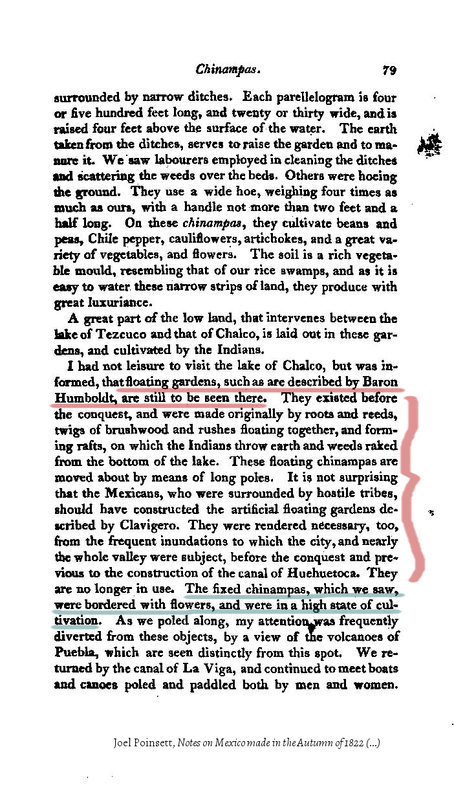 Poinsett’s reference to chinampas comes from a book digitalised in Archive.org. Another wonderful article that examines the myth of the floating garden and puts it to the test (floating chinampas would fall apart…) is Willey, N. L. and García Prada, C. 1939. El Embrujo de Las Chinampas. The Hispanic American Historical Review 19 (1): 83-99. Crossley’s academic profile is here; it includes a link to his website on chinampas. FAO also devotes a section to chinampa agriculture; despite not floating, chinampas are an amazingly productive system worth protecting, perhaps even replicating elsewhere (with suitable conditions). How to build a chinampa? If you understand Spanish, you can check out the manual I cite, right here. One of the latest articles perpetuating the myth of the floating chinampa can be read here: The Ingenious Floating Gardens of the Aztecs | Eco Snippets. Lovely header picture and black&white shot of sunrise in a Xochimilco chinampa come from flick user Serge Saint’s wonderful album, Amanecer en Xochimilco. Go have a look, because they are simply beautiful. Next one, as previously mentioned, comes from Arthur Magin’s Histoire des jardins anciens et modernes (1887), digitalised and freely available via Biodiversity Library. Picture of current chinampa in San Luis comes from Crossley’s website (link below the picture); I’ve already referenced the origin of Poinsett’s manuscript image. Painting by Villegas comes from Wikipedia (see link below picture). All other photos are by Yours Truly; please send me a line if you wanna use them!